Home Cycling El Caja Rural, with "the best staff in recent years"
El Caja Rural, with "the best staff in recent years"
The team presented itself at the headquarters of Seguros RGA, sponsor of the structure, celebrating its 10 years in professionals and remembering the figures that have passed through the team. 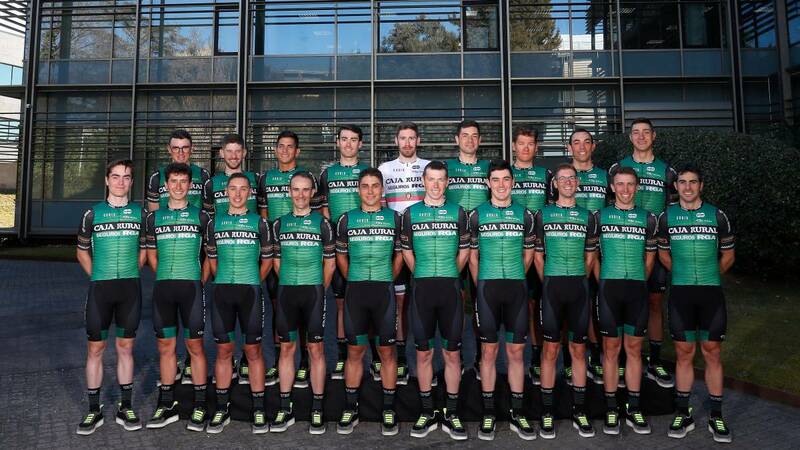 Michal Kwiatkowski, Omar Fraile, Pello Bilbao, David De la Cruz, Mikel Snow ... are some examples of the promotional work that Caja Rural-Seguros RGA has done in recent years. And with that spirit and that objective held on Tuesday at the Madrid headquarters of Seguros RGA an act of presentation of the amateur and professional staff of 2019. "The best of recent years", according to the team's manager, José Manuel Hernández. A team with an average age of less than 26 years that presents eight novelties: the Russian Sergei Chernetskii, the Italian Matteo Malucelli, Jon Aberasturi, Domingos Gonçalves, Alan Banaszek, the world track champion Sebastián Mora and two cyclists from the subsidiary elite and sub 23; Xavi Cañellas and David González. "We have incorporated young and fast runners for the stages that are decided by sprint and men who are doing very well up, a mixture of youth and veteran", analyzed Hernández about a formation that will have Sergio Pardilla, the veteran climber (35 ) of Ciudad Real, as the reference for the mountain and with multiple options for the massive arrivals: Aberasturi, Soto, Malucelli ... In addition, the coaching staff will have Joan Llaneras, Olympic and world track champion, whose son works in the team Sub-23. A act that, in addition to showing the sporting novelties, served to reaffirm the bet of the two main sponsors for cycling. "Cycling is the sport of all, the one that reaches every corner," said Ricardo Goñi, director of institutional relations at Caja Rural. Pablo González, general manager of RGA who acted as host, was in the same line: "We are proud that the team has our brand throughout Spain." This feeling is reaffirmed with the studies we have done, which confirm that we are complying with the strategic objectives ". Professional: Jon Aberasturi, Julen Amezqueta, Alex Aranburu, Alan Banaszek, Xavier Cañellas, Sergei Chernetskii, Álvaro Cuadros, Domingos Gonçalves, David González, Jon Irisarri, Jonathan Lastra, Matteo Malucelli, Antonio Molina , Sebatián Mora, Mauricio Moreira, Sergio Pardilla, Cristian Rodríguez, Gonzalo Serrano and Nelson Soto. Élite and Sub 23: Iñigo Altuna, Diogo Barbosa, Jorge Bueno, Juan Fernando Calle, Jefferson Cepeda, Josu Echeverria, Luis Mari Garikano, Sergio Ginés, Juan Esteban Guerrero, Pol Hernández, Iñigo Lazkano, Pau Llaneras, Andoni López de Abetxuko, Sergio Martín, Guilherme Mota, Jokin Murguialday, Joel Nicolau, Alfonso Pla, Eusebio Pascual and Carmelo Urbano.